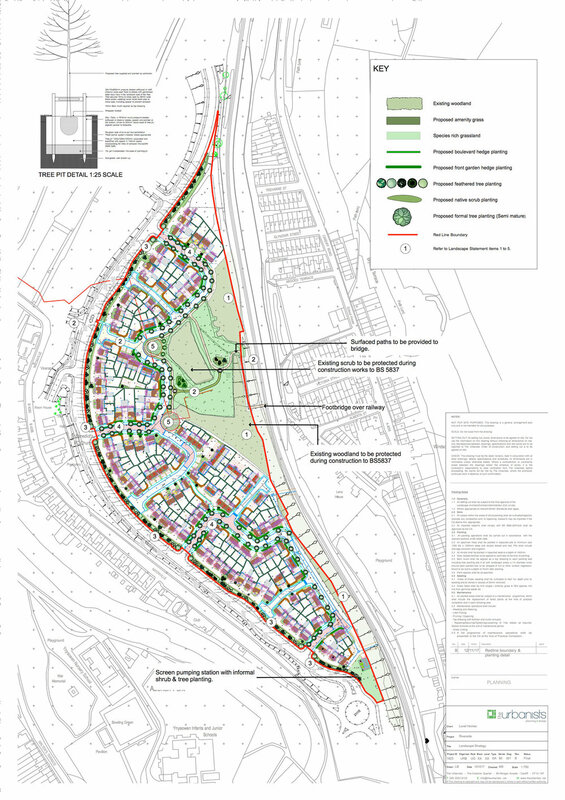 The Urbanists were commissioned by Lovell Homes to provide Landscape Design services to support a full planning application for 153 homes on the former Merthyr Vale Colliery, Aberfan. This commission followed our earlier involvement, working with Merthyr Tydfil Council, to establish a development brief, framework and masterplan for this culturally sensitive site, located between the communities of Merthyr Vale and Aberfan. The site possessed a number of challenges including former mine shafts and constrained cross valley routes. Retain and ensure the positive management of the extensive existing green infrastructure enclosing the site. Define and integrate key strategic pedestrian and cycleway corridors through the site with ornamental tree, shrub and grass. Ensure that the development frontage along the new Link Road (Golwg yr Afon) is well integrated. Reinforce the internal hierarchy of streets through formal boulevard tree planting and generous verges. Provide a ‘necklace’ of hard and soft open spaces through the development, including provision for play and informal seating. The development received full planning permission at committee in February 2018. Work on this key regeneration scheme will commence during summer 2018. It is envisaged that completion will take around 3.5 years.